Welcome to Day #3 of Chocolate, Bourbon and Whiskey Theme Week. 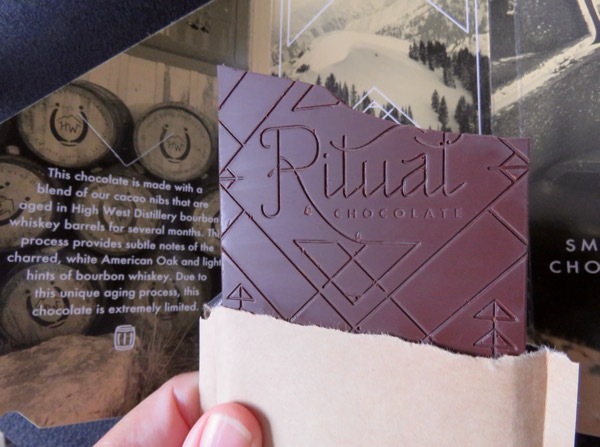 This Madagascar Bourbon Vanilla 70% Cacao bar "crafted at 7,000 feet" by Ritual Chocolate (Park City, UT) managed to attain an ideal state: a creamy, smooth texture and complex, rich flavor. To get a creamier texture or mouth-feel, a chocolate maker usually conches or grinds cacao for a longer period of time, achieving a finer particle size. However, in doing so, more volatile flavors can be lost during this process. This chocolate was made using a special (Mid Mountain) house blend of cacao beans from different origins. Today's complex, well-balanced dark chocolate bar contained flavor notes of cherry and vanilla—but not just flat, dime store vanillin in alcohol. Rather, it was an earthy, faintly smokey, authentic ground vanilla bean vanilla, from Madagascar. High-quality Bourbon* vanilla from Madagascar-grown beans is much prized. *The term "Bourbon vanilla" does not involve any whiskey. Instead it refers to vanilla beans (orchid Vanilla planifolia) originally from the Americas, that were (like cacao and other crops) taken to be cultivated in Madagascar and other islands in the Indian Ocean. (One of these colonial islands was once known as Ile Bourbon.) Bourbon vanilla is slightly different than Mexican vanilla and quite a bit different than Tahitian vanilla (which is more aromatically floral). Welcome to Day #2 of Chocolate and Bourbon Theme Week. 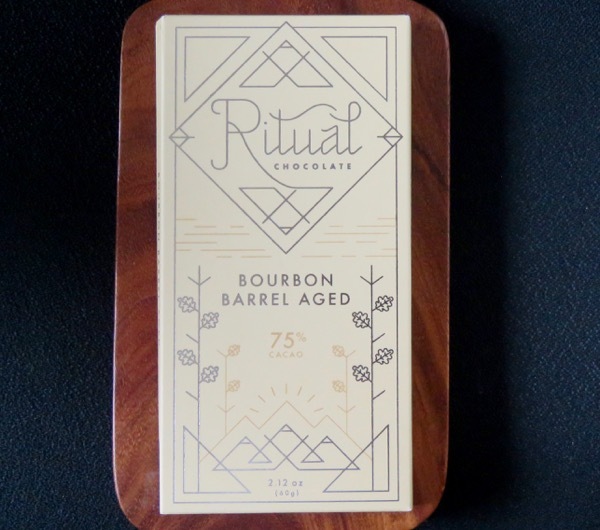 Today's Bourbon Barrel Aged 75% Cacao bar from Ritual Chocolate (Park City, UT) was made from a blend of cacao nibs that were aged in High West Distillery* bourbon whiskey barrels for several months. 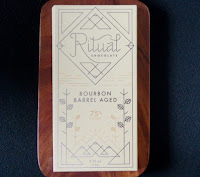 This 75% Cacao dark chocolate bar had a dark chocolate and slight bourbon aroma. 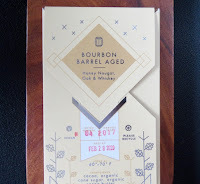 The vegan, relatively thin, bar had an even, smooth melt—and a complex, smooth and uniform dark chocolate flavor with notes of coffee, very slightly smokey, bourbon-soaked fruit (mild cherry), light oak and honey, and a slight nuttiness. The bar came with this evocative tasting suggestion: "Best enjoyed alongside an alpine babbling brook with a flask of your favorite whiskey." *Based in Park City/Salt Lake City (Utab), the High West Distillery is a "ski-in gastro-distillery." Their Old Town Park City mountain location (approx. 7,000 ft. in elevation) is based at the bottom of "Quittin' Time" ski run near the Town Lift.